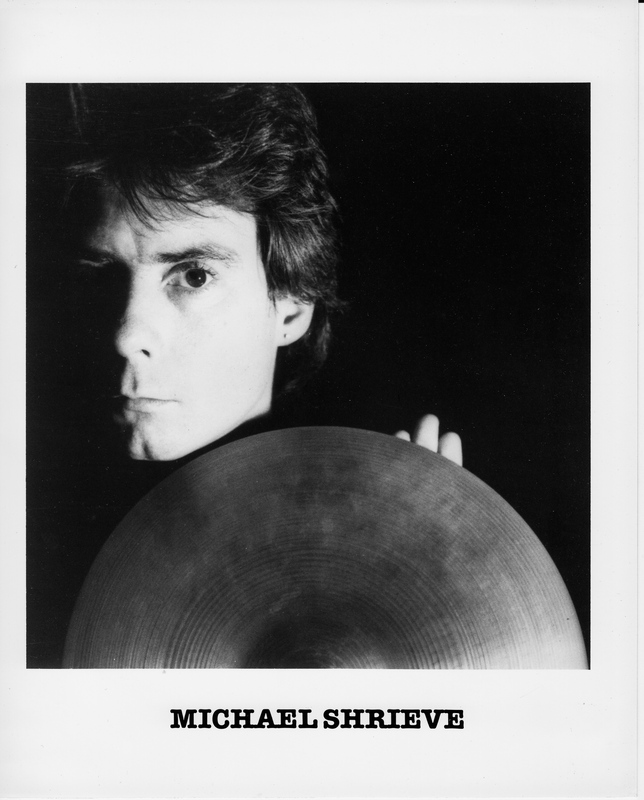 SKF NOTE: I have fond memories of the time I spent with Michael Shrieve putting together his Modern Drummer interview. Of all of the drummers I interviewed, Mike Shrieve was immersed in the most varied aspects of drumming. Really, he was fascinated with sound and color and how each, separate and combined, is used for positive goals. He introduced me to the fields of music therapy and color therapy. 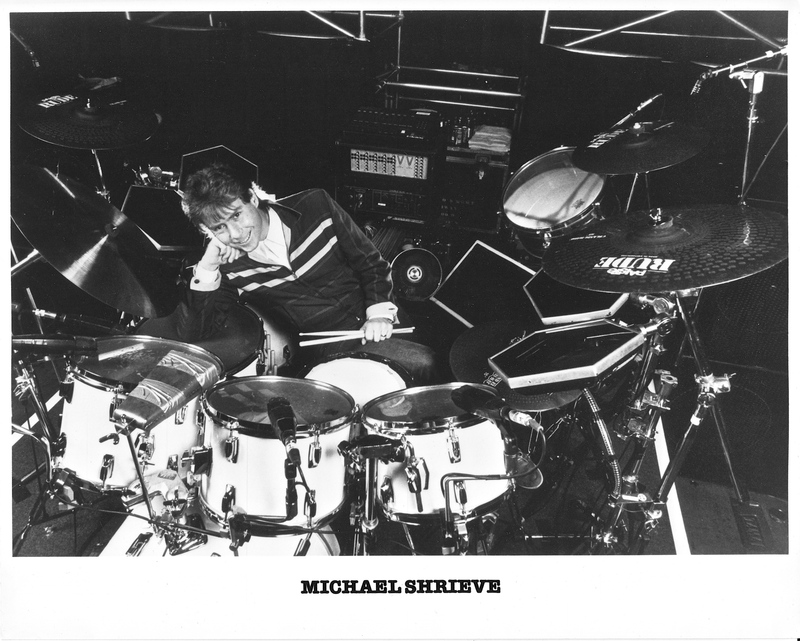 Mike Shrieve was also among the first drummers using electronic drums. He was also very familiar with what is now called World Music. And he showed me a common sense idea for setting up my drumset I have used ever since: Where to position your hi-hat and bass drum pedals? First, sit down on your drum stool. Place your feet on the floor naturally. Where do your feet go instinctively? Well, that’s where you put your hi-hat and bass drum pedals. The challenge interviewing Shrieve was this: I would interview him, he’d talk about his current project or band, and then before his interview was published Michael was on to a new project or band, rendering his interview obsolete. So we would reconvene for an interview update. 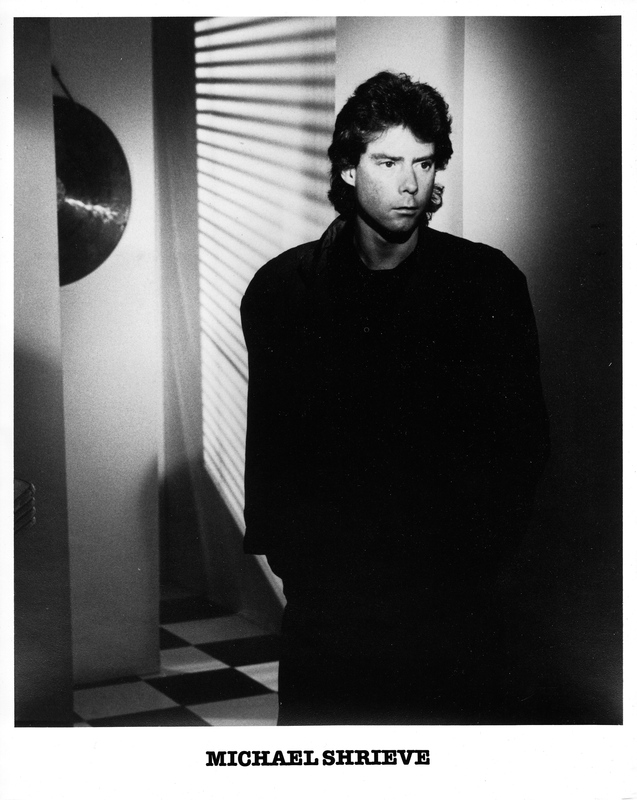 Michael introduced me to his albums with percussionist Stomu Yamashta, Steve Winwood, Klaus Schulze, and Al Di Meola. The band, co-found by Shrieve, was called Go. They released a series of wonderful albums Live From Paris (1976) Go (1976) and Go Too (1977). We finished Shrieve’s MD interview when he had formed Novo Combo — a more pop oriented band. I’ll have to double-check when I find that issue of MD, but I think Shrieve had moved on from Novo Combo by the time his interview was published. 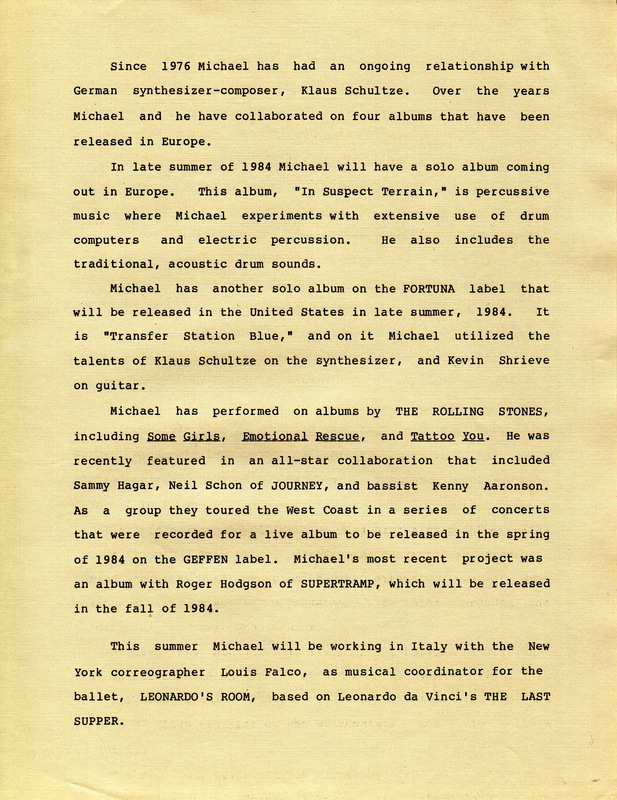 In 1986, Michael’s brother, Kevin, joined Michael and Klaus Schulze on another album, Transfer Station Blue — which I liked very much. Soon after, I lost touch with Michael Shrieve. The next time I saw his name was in 2001 as producer of the Bill Frisell and David Holland and Elvin Jones CD. 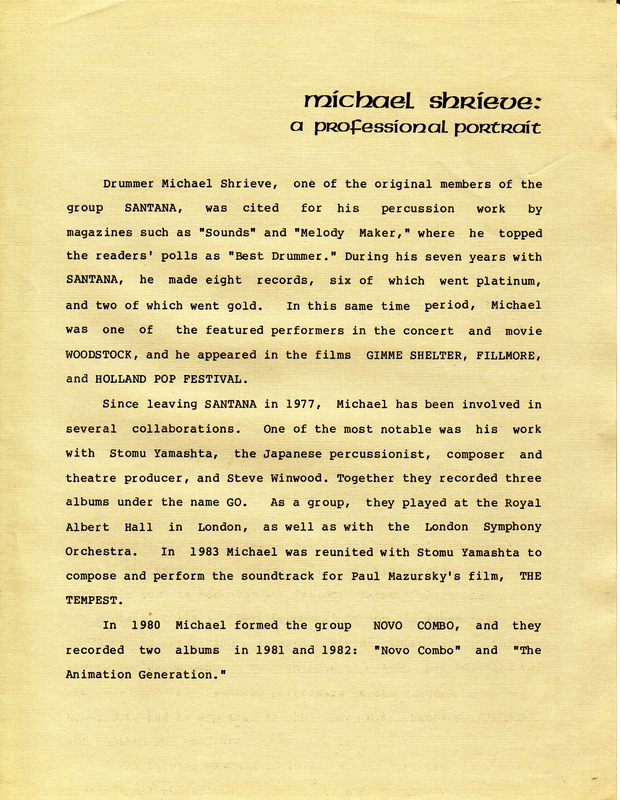 Finally, I came across this Michael Shrieve press kit last week. Three photos and three sheets of backgrounder circa 1983. SKF NOTE (11/12/15): I came across this review of GO in concert in the December 15, 1977 Down Beat. 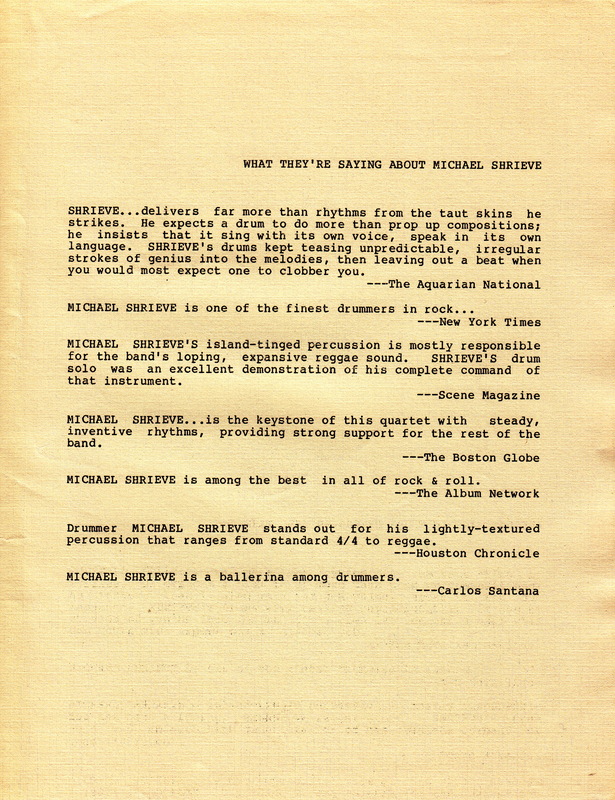 This existing Michael Shrieve thread seemed a good place to add the review. 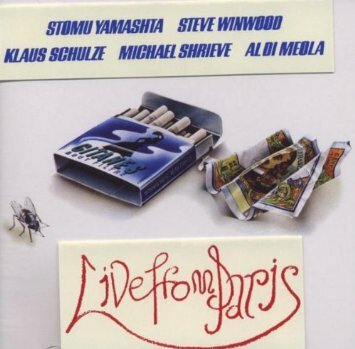 This entry was posted in SKF Blog and tagged Drummer, Go, Klaus Schulze, Michael Shrieve, Scott K Fish, Stomu Yamashta. Bookmark the permalink.